Demolition for Historic (1925) Van Nuys Lutheran Church? Maria Scherzer sent me an email today saying that she believes that the historic 1925 First Lutheran Church of Van Nuys at Vesper/Kittridge may be scheduled for demolition. Does anyone know if this can be verified? I grew up close to this building and would ride my bike in and around it for years, never once seeing it open or in use. It both intrigued me and scared the hell out of me. I was driving one of my kids around the neighborhood showing them where I grew up and when we passed the building on the corner I wondered who owned it and if it was ever used anymore. I think I’ll go by there today and grab a few photos of the neighborhood before its gone…if I’m not already to late. From what I’ve heard, the bulldozer has already visited this site. Thanks for the comment, and if you take photos, please send me some. For the “Centennial” (lawn signs, not plaques) to remind everyone of how many Van Nuys homes date from the l9l0’s and l920’s. Taking a wall along the “Orange Line” between Kester and Sepulveda and doing a “running Van Nuys mural” of the older Van Nuys, as if the painting the best of the older Van Nuys homes in a streetscene along this linear mural would remind us of the past. Sad to say–you won’t find any of that in Van Nuys. And these are the small “victories” neighborhood councils promise to those who would join. so that people would want to buy the “better” remnants of that past–and to do the kind of mixed useages (a lawyer “hanging his shingle” on a house he lives in–and works in) that could save Van Nuys. So all of your worthy proposals were not enacted. Who are you blaming for no support and no interest? Leadership is about persuading and leading. Good thread. Ive tried to look up vnnc. But no website. I see shiney new banners but no presence. Im Sad to see van nuys losing what little history and charm it has. Looks like a cool area around that church. It would be horrible to see a cheap apartment complex go up in its stead. people on the entire planet know how to create and maintain one. So the small quaint church may disappear and, based on the other photo, a nice large tree next to OSH will be cut down. But all the lovely wood utility poles quite visible in both sections of Van Nuys will remain proudly standing, in their wonderful glory. That’s classic LA for ya’. I will ask Van Nuys Neighborhood Council to agendize this issue–ask Councilman Cardenas to comment–and consider “historical landmark” status for the church. Those “items” do not lead–necessarily–to guaranteed “action”–but they show concern. Churches (the owner, the church next door) can claim “exemption” from “landmark status”–the church’s simple architecture does not inspire greatly–and I’ve yet to find the 90 year old who can provide the “human story” for the building. (across from VN Elementary) show that a “fresh look” might be helpful. A bit of a concern of cultural “imperialism”–the Church of the Valley actually is the poor relation of the famed Little Brown Church of Studio City–and that this Studio City based group doesn’t care about “poor Van Nuys” is also worthy of comment. But–even if you have “Mr. Potter” (from “It’s a Wonderful Life”) as a “landlord”–there’s no “storyline” of people who would be thrown out–no group eager to come in. HERE IN VAN NUYS suggested an “adaptive reuse”. Maybe we should call HABITAT FOR HUMANITY–as the Valley turns l00–and many buildings approach the century mark–HABITAT ought to consider this building–or another–for a “special reconstruction project”. Sounds like a good idea Jon. Thank you for your ideas. The member of the Van Nuys Neighborhood Council made his motion–he got Reverend Willoughby from Church of the Valley (the church next door owns the old orphan church) to come–and his group (VNNC) would not cross the line to take a position. Preservation of empty buildings is a problem–“preservation” is often a morality play–with poor tenants or good causes against a greedy landlord–and that seems not to be here. The City’s Historic Preservation Officer, Ken Bernstein, hasn’t been heard from–as yet. But demolition seems inevitable. This stands as a wake-up call for readers–if they see something in Van Nuys they are not sure has value–they ought to E-Mail me or do the work as Ms. Shertzer does. They may think Van Nuys has an HPOZ (Historic Preservatin Overlay Zone)–but on closer examination, you’d see a checkerboard of “covered properties” and “exempted properties”. A perceptive citizen’s group could have made an “issue” of saving the old church–but it was “exempted” years ago. It’s “loss” to the fabric of Vesper Av (you should look closely at that fabric from the fabulous Baird House through the Church of the Valley and it’s “unwanted orphan” that it’s tearing down) hurts. Our lack of perception has failed us. Take the old Van Nuys Library (l925)–it could have been “kept” by the City–you are only lucky that a responsible private party did an excellent job to preserve it–but try to walk inside and look? ZILLOW will tell you how old a house is–the DAILY NEWS, in the l920’s–did stand-alone articles for every new church of building in Van Nuys (go to CSUN)–you can even see a “hand-drawn map” of each and every building in Van Nuys done throughout the l920’s by the Sanborn Fire Insurance Company–so they could sell fire insuranc(also at CSUN). Van Nuys’ “preservation attempts” have been largely expedient. Homeowners who wanted to “protect” their homes–or “save the block” from apartments did–the other public buildings of the town have simply (luckily) been passed down to responsible owners. View this as the appropriate warning–even a church would tear down a church. 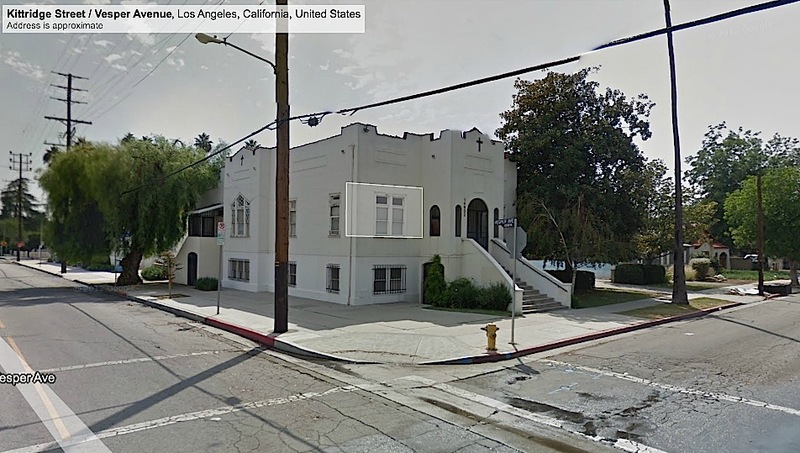 A closer look at Friar St.–just south of Victory–will give you pause–cute homes will soon vanish. .
One might suggest that a town like Van Nuys would have gotten a lot from letting doctos and lawyers turn over historic homes into quiet, small offices. It still might happen–but those who would build apartments in the crowded old core of Van Nuys will probably win. Perhaps–perhaps–with the upcoming l00th anniversary of Van Nuys High, we can develop a broader community spirit to look at Van Nuys more closely–as we did not do for Van Nuys’ Centennial in 2011.
the unstable annex building on our COV property….. The “annex building”, aka “a house of worship”, was never abandoned. lack of thoughtful planning, disdain for history and integrity of greater community. Hi Andy, I think you can check with the city and see if a permit has been pulled to cap the utility or sewer lines… This is usually an indication a building is going to be torn down. I hope not. Ms. Shertzer does talk to me–as the VNNC member with a historical interest (I tried to save the old Van Nuys library)–I can’t see everything. window above the pulpit has been removed? Did anyone know if it was unique or relevant? Has anyone seen the large cracks in the building? Don’t ignore them–they won’t go away. In my 55 years in Van Nuys, I never remembered that building as an active church. So–has anyone been inside to comment about it? Who among the critics have been inside the Church of the Valley–even? I have–once–and I’d invite any of you to organize and come next Sunday and try to get a discussion. Where is that person? I’d want to talk to him. Don’t point nor criticize–but bring the historic context that can save the church. Thank you for the comment John. My question is what will go in place of the building? Who or what is going to built there? There is a show on HGTV where people live inside repurposed buildings, old industrial and church spaces. might be going the way of the wrecking ball. Again–the church next door which “owns” the other church suggests that the building is unsafe to use. As always–a second opinion might suggest otherwise. Those who don’t look closely at that neighborhood miss the connection that there are 4 churches in this area–that once made Van Nuys the “City of Churches”. The Christian Scientist Church, built in the late l920’s at cedros and Hamlin is the most attractive of them–St Elisabeth’s the largest, and first catholic church in the area. In a different time, in old Van Nuys, the churches were all built away from Van Nuys Blvd and the streetcar line–for a quiet Sunday meeting–while now churches would be up on the boulevard like car dealerships and supermarkets. John Hendry of Van Nuys Neighborhood Council was told as much–by the man working “parking lot security” on a Sunday a year ago. That being a year ago–may suggest it’s on their mind–but that they’re not so sure. And what was the response of the VNNC? Anything? This is one of the oldest and most historic buildings in Van Nuys. Should it just go under and be replaced by a parking lot or pink condo? With his membership, or that of one of his readership, I would have heard about this. thousand meetings waiting for anyone to say “You know–that’s an interesting building–I’d like to know more”–are disappointed. came to me concerning the impending demolition of the Church. One could sit, as you do, on the VNNC, along with the other council members, and communicate absolutely nothing to the surrounding population. I agree it is noble, and pro-active to attend VNNC meetings and some of my neighbors are doing so. that there actually exists a VNNC and that is here in 2012.